"Peace I leave with you; my peace I give to you. I do not give to you as the world gives. Do not let your hearts be troubled and do not let them be afraid." I read this wonderful promise and then I attempt to capture in words something of the gift of the one who has died. I hope that the remembering will bring them some measure of peace. And I hope that the gifts which are passed along and which continue to take root in future generations will also bring some peace. However, I am deeply aware that this 'peace' the world offers is fleeting, merely pointing to the something more that God has in store for us. And even that less than perfect peace is rare --- living as we do in a world which knows little of peace at all. Perhaps my memory is clouded by nostalgia, but I like to think that at least here in this country this was not always the case. Oh, I did not grow up in such a small town that we ever left our doors unlocked, but my dad would attach a key to a plastic cool whip lid and hang it in the garage for those times we would inevitably lock ourselves out. Anyone could have found it there and so yes, it did seem like a safer time. And yet, if I take a closer look, I know it wasn't as 'peaceful' as I like to recall. By the time I was the age of those same confirmation youth, I certainly was aware of heroes having been murdered, of cousins and neighbors dying at war, of families torn apart by mental illness and violence. And yes, by the time I was confirmed in my faith, I also knew what it was to be shaped by a congregation which was at war with itself. Peace, any kind of peace and certainly the sort that Jesus offers now, has always been elusive. And as I've thought about what it would be to pursue this peace, I find I can't say for sure if it's something that begins inside of us, or between us, or if it lives as some kind of rare synergy of the two. For a lot of years now I have found myself stepping into congregational settings which have been scarred by the sort of conflict of which no one ever wants to be a part. If I had to venture a guess as to just why that is so, I might say I am called to healing work because I was so shaped by a church fight when I was young. It also could be because such situations are so plentiful. Indeed, one wonders why there is so little peace among those whom Jesus first promised peace. Is it about unrealistic expectations? Is it as a result of a changing world where we don't quite know our place any more? Is it just that we are so very human and so we should expect that there will be problems among us and between us? Have we brought too much of the world to our way of doing things or not enough? As I said, I've followed more than one church conflict as a pastor. I can remember the first time as I began I spent a year studying the consultation reports and asking the questions --- trying and trying to figure out 'what had happened.' As though my understanding or being able to articulate it would make it better. After a year I simply gave up and moved ahead in ministry. This time through, while mildly curious and certainly wanting to hear people's perspectives, I knew I'd probably never fully get to that 'truth,' whatever it was. I've learned finally that in the end, the causes of conflict, of war, of struggle, of pain, are much the same and that assigning fault or reason, though sometimes helpful, still only gets us so far. And in the end it doesn't take away this truth: As God's people, we are always called to live in peace and at peace. We are called to be models of and bearers of the peace Jesus gives to his disciples now. For our own sakes. And more than that, for the sake of the world. And so as I sit with Jesus' words a while longer now I realize that perhaps this is where it starts. Maybe this peace is not something which begins in me or between you and me. No, Jesus would say this peace begins in God's heart and is always simply received as a gift from God's own hand. It is ours to receive, to cultivate, to share, but it is not ours to create. It seems that among the people I am serving now we are beginning to understand the truth of this. I could not have known this when we began, but late last summer in a conversation at our staff table we were reflecting on a spontaneous blessing I had shared with college students who would soon be heading back to school. One among us commented on how much that meant to her. And as a result we found ourselves planning a 'Year of Blessings.' So since September we have blessed all sorts of things and people and circumstances: from labor to veterans, from prayer shawls to school kits, from birthdays to upcoming surgeries, from mission trips to our website to visioning conversations and on and on. Some weeks we have one 'blessing' planned and then we wind up with another walking through the door. And here is what has happened in and through all those blessings. We have seen God at work and we have continued to remember it is God at work that makes it happen: the healing, the hope, the promises come true. It is like God's peace it seems to me. It is God's doing, not ours. And here is what has happened as we have continued to remember and celebrate God's blessings. I'm told it's taking longer to share the peace. Somehow as together we have embraced and celebrated God's gifts week after week, we are also able to see God at work in one another. Is this peace Jesus offers now something that begins inside of us? Yes. Is it something that is lived out between us? Yes, this must be so as well. Most of all, is it something that comes first from outside us? Yes, it seems this is especially so. Indeed, it seems we do best by beginning there. By paying attention to all of God's good gifts, by staying alert to what God is already doing, perhaps we also know something of the peace God intends for us even now. How do you find yourself thinking about the peace Jesus speaks of now? Does anything in this life compare to it? If so, how is it that we realize it? In a world which knows little peace, how is it that we understand what Jesus speaks of now? How is it that we describe this to others? It seems to me that simply opening our eyes to how God is working among us and through us might just be a way to experience something of the peace Jesus offers now. What do you think? I was standing in a hospital room many years ago now. It was during one of a dozen such stays after my dad's first heart surgery. A group of friends from his church had come to see him. As I remember it, they stood awkwardly around his hospital bed, fumbling for words to say. Pretty soon, one of them offered to pray and once he was done, they did not take long to head for home. This was a kind group of people. They had traveled out of their way to make this visit and they had to coordinate their schedules to do so. Still, they stumbled as they spoke, clearly uncomfortable seeing my normally gregarious dad hooked up to all kinds of tubes and wires and looking so very discouraged. They were not terribly good at it, I have to say, but I quickly learned that it didn't much matter. For no sooner had they left his room than my dad turned to me and speaking with great conviction he said, "Anyone who doesn't have a church home is stupid." To be sure, usually he was a little more eloquent than that. And as you can well imagine, I would hesitate to use his verbiage as a tag line in my congregation's outreach effort, for I can't imagine it would attract many who are not already here. Still, he was at the point in his life when he wasn't mincing words. And he meant what he said. For he had experienced over and over again what love looks like in the company of God's people. The kind of love that shares time, resources, hopes, and prayers. Love lived out through the sort of folks who, though far from perfect, often did what they could to build up, to support, to simply walk alongside. People who try to live the kind of love that Jesus points to in our Gospel lesson for today. My dad had given and received this over and over again and he could not understand why everyone wouldn't go and find that, too, given half a chance. Oh, I realize, of course, that my dad may have been more fortunate than many. I know that there are times when you and I as God's people do not live up to that expectation to love one another which Jesus so clearly lays out for us today. Although, I would venture to guess that as often as not it is not because we do not care. And it may not be because we do not want to. Rather, I think we often hesitate to share that love because we are afraid we won't do it right. Or it won't be enough. Or that we will intrude where we might not be welcome. We have not all experienced loving one another as Jesus would have us, of course, but I am grateful to have known the gift my dad's words point to my whole life long. I would offer you now a couple of examples lived out by one congregation when I needed it most. The first followed my journey home from the hospital on a January morning. My dad had died late the night before, you see, and I had to head home on a Sunday morning to get funeral clothes before going back up to my hometown in time to meet at the funeral home later that day. I tried to time it right, for I was exhausted --- we had kept the vigil for three weeks by then --- I tried to time it right for I really didn't want to see anyone from my congregation there --- I only just wanted to sneak in and out again. My home was right across the street from the church though and sure enough, although most everyone had headed home with the hour approaching noon, one had not. As I stepped out of my car another car pulled up behind me and Marie got out, walked over to me, and hugged me. I don't remember if she said a single word, but I've never forgotten it, her kind gesture of love. The word came to me in the days that followed that the neighboring pastor who had stepped in for me that Sunday morning had gotten the call at 6 a.m. saying our vigil had ended. Sometime between then and our 9 a.m. service he rewrote his sermon to offer words of wisdom on how to care for a pastor who is grieving. Truth be told, he was not known as a polished preacher, but I will tell the story of how he showed love for me and for my congregation my whole life long. By the next Sunday I was back in the pulpit. I could have used a little more time, but I had unexpectedly been gone three weeks already and knew I needed to get back at it. Still, I have never forgotten the kindness of the people there in those first weeks back with them --- and have often shared how they never questioned the time I took to be where I knew I had to be. They only just loved me through it all. As I said, I am so very grateful to have experienced the love of God's people --- particularly in a time when I needed to receive it most of all. It is worth wondering now, it seems to me, how we can be more and more that way so that, in fact, more and more the world "would know that we are disciples of Jesus, as we have love for one another." I know I am not speaking here to those myriad congregations which are torn apart by something that bears no resemblance to love at all. Still, I wonder if we all just took that first step and in love walked into a hospital room which holds a friend, stopped our car to hug someone who is grieving, changed our words to meet the needs of our listeners, and saw one another in all our humanness and only wanted good for them -- even if there was some cost to us ourselves....Wouldn't that begin to change even those places which have become marked by avoidance, by anger, by fear, and yes, even by hurtful violence of words and sometimes actions? Oh, I have to believe that even our stumbling, fumbling, hesitant reaching out in love to one another can begin to change everything for somehow God takes it then and makes it something more... Indeed, wouldn't it be something if one day along with my dad all the world could not imagine a life without God's people to care for us? Wouldn't that be something? When and where have you experienced the love of God's people as testimony to our shared faith in Jesus? When and where in have you seen a faith community living this love as witness to the One whom they are called to follow? What is their story? In those places where it is not so, what needs to change to make it so? Where might that change begin? I stepped into the funeral home on Tuesday afternoon. I had met with the family on Monday. The woman's daughter described herself and her family as "spiritual but not religious," although their roots were Lutheran, which is why the call came to me. I spent extra time that day walking through the funeral service itself, since it wasn't terribly familiar to her. When I came to the point of asking if they had preferences for scripture, she looked at me blankly. And then she said, "Grandma will be here soon. She is the one who is a life long Lutheran. Maybe she'll have something she wants." June, her grandma, did arrive within minutes. She had ridden along with daughter and son-in-law from Minot, North Dakota. It had been a long drive and every bit of her 84 year old body and spirit were clearly spent as she made her way through the front door. She wrapped her arms around her granddaughter and was kind when introduced to me. Only I guess in her surprise at being asked, she had no thoughts on the matter of favorite scripture either. By Tuesday afternoon she did, though. For when I asked again, her bright blue Norwegian eyes glistened as she said, "I don't know where it comes from, but I want "I lift up my eyes to the hills, from where is my help to come..." Psalm 121. And so we read that beloved Psalm at her daughter's funeral the next day. June has been listening to our Shepherd's voice for a very long time. She may not have been able to quote chapter and verse, but still it returned to her again in her time of great need. On Friday morning I stopped at the hospital to call on a 2 year old. Her grandpa had called the night before to say she had been admitted with pneumonia. Hospitals can be frightening places for anyone, but perhaps especially for little ones who can't make sense of what is happening to them. As I walked down the hallway I heard her before I saw her. But no, she wasn't crying. Rather, when I walked into her room I found her sitting up in her crib singing. She was in her pajamas, with a sleeve wrapped around the arm which held her IV --- put there to protect it from her curiosity or fear. Attached to her left big toe was a pulse oximeter (and yes I had to look that up). Her little fingers are too small to hold it, but of course they still need to measure the oxygen level in her blood, and so they made do. And she was sitting up and singing. It was clearly a tune of her own making and the words were jumbled and difficult to understand, but it was a beautiful melody even so. I smiled at the unexpected sound which continued throughout my brief visit with her mom and followed me down the hall as I left for other errands. I wondered as I drove away at the wonderful sounds which must have filled her life so far that she would sing in that frightening time and place. And I wondered, too, if maybe she sang in part to comfort herself --- her mind retrieving gladder times and they then just spilled over in her little child's voice --- bringing with them the promise of glad times again. I'm thinking that two year old has been hearing our Shepherd's voice already... maybe through the sounds of earthly voices of those who love her, living out their promised protection and tender care. And perhaps in ways we can't understand but only children can. Perhaps she hears the Shepherds' voice as well and as she does and continues to do so I expect it will carry her, too, her whole life long. Jesus speaks to us of the Shepherd's voice today. It is a voice of promise. It is a voice that promises stubborn protection and care. It is the voice the flock hears and knows and follows. It is the voice which is especially precious in times of struggle and pain. And it is one we sometimes have to work harder to hear in better times when other voices especially seem to drown it out. And yet even when those other voices overwhelm; yes even when we don't pause to listen it is always there, inviting and comforting and urging us on. In times when I can't quite hear it, I find I am especially blessed to hear others witness to its sound --- whether it be those who grieve asking to hear again the promises our Shepherd's voice has whispered in her ear her whole life long or it be the beautiful song of a little one --- singing through her pain and fear and in her soft melody pointing to the safety and protection and joy she has already known --- as only a two year old can. For oh yes, it is so that when I can't hear it for myself I do find myself grateful to be able to walk with others for whom that precious voice is ringing clear. Those times remind me to pause and listen, too. For our Shepherd's voice is calling out to me as well. What does our Shepherd's voice sound like to you? What promises does it speak? What is the Shepherd calling you to? When did you last hear someone else testify to its sound? What do you have to do to be able to listen more deeply so as to hear that voice? What needs to be set aside, turned down, put off until later so that you can pause and listen, too? I can't really imagine what it must have been for Peter and the other disciples as they gathered on the lake shore that night. There is certainly nothing in my own experience that parallels what they have been through: to watch Jesus crucified, to have participated in it by their own denial and quickness to flee, hoping that would somehow ensure their own safety. And then the shock of the resurrection, the wonder of having Jesus actually appear to them and now simply trying to get their own minds around this new, utterly unprecedented reality. No, there is nothing in my own life experience which compares, but I do believe I can understand their reaction now. I can understand their deep desire to return to the familiar --- Peter's yearning to simply do what he can do without thinking about it... pushing the boat out into the lake, lowering the nets and raising them again, hoping for a good catch. In fact, I'm thinking Peter can do this with his eyes closed and he probably is doing just that as he continues to work out in his mind and in his heart the unbelievable events of these last days. I understand that, for we do the same it seems to me. In times of crisis, or loss, or fear, or uncertainty, we grasp for what we know for sure, returning to familiar routines until our mind and heart can catch up with one another. Until we find ourselves ready to step out in faith and hope again. So I understand that, and although it does not compare, I think I can also understand something of their state of mind then. For I believe I found myself in such a place not that long ago. This is how it was for me. I had entered into a new and different kind of work, believing it would use my gifts well and that it would give me the opportunity to deepen those gifts and to develop some new ones. I began it thinking I could be a part of making a difference. It didn't work out that way. Before long I found my most deeply held values at war with one another. I discovered that many more days than not I was being required to do work which did not begin to use the gifts I had been developing my whole life long. I was deeply unhappy and found myself covered with a shroud of uncertainty and fear. I did not know what to do next. I had been in this place only a couple of months by then and had begun to share some of my struggle with some trusted friends. One of them told me then that another friend had told her to tell me, 'You tell Janet to start writing again.' This was offered with the best of intentions, I know. But even so, in my darkness, even that I was not able to receive well. In fact, I can remember my reaction was one of deep grief, for by then I was literally not certain I had anything to say. And then on a morning commute a few days later in those dark mornings before Christmas I remembered a Christmas story I had told before. I went home and wrote it down. I called a friend with the idea for this blog and tentatively I began to write again. I was wobbly at first, but soon I found my stride, and whatever else has been true in the last eighteen months, this has also been true. In this sharing of the journey in this way, I am living more deeply into my own faith and discovering daily what it is to follow Jesus again. So, yes, I do have a little sense of the utter fear or uncertainty or hopelessness that may have enshrouded those disciples on the beach so long ago. I know what it is to feel caught and to only know to return to what one knows the best. It is what the disciples appear to have been doing and it is what continues to happen after Jesus makes himself known over a charcoal fire and a meal of fish and bread. For pretty soon we hear Jesus pull Peter into a private conversation asking him over and over again the most basic of questions, "Simon, son of John, do you love me?" What do you know for certain, Peter? What have you staked your life and hope on before? Only this conversation does not end with only a spoken affirmation of Peter's deepest held values. Rather, it offers concrete direction for Peter, and I would venture to day for all of us as well as Jesus puts the call into the simplest of terms: Feed those whom I love. Care for them. Give them what they need. And then Jesus ends it where he began with Peter three years before, with the simple invitation to "Follow me." Have you ever found yourself in the dark place of fear or uncertainty the disciples appear to be in at the start of today's story? What was that like? How were you led out of it? Or are you still there? If that is the case, how might this story offer direction or hope to you now? The question and the command posed to Peter are meant for us as well. What does it mean to you to say that you love Jesus? How are you called upon to "feed Jesus' sheep" where you are today? apart. 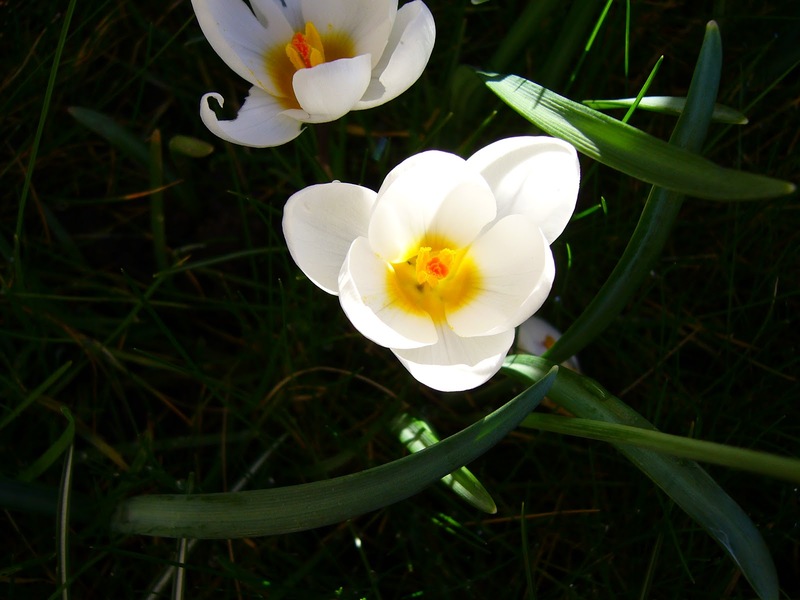 Rather, the green shoots and the bright white blossoms poke their way through the grass all over the front lawn. I remember what a precious surprise it was the first time I happened upon them. Now I go looking for them early in the spring. I go because I've seen them before. I go because even when there there is no other evidence of life just yet, I know they'll come again. They always do. I found I wondered though as I continued on my walk about how those children learned about hopscotch. In this age of smart phone apps and video games and mostly organized sports, somehow children still learn to draw hopscotch on the sidewalk and to jump through the squares. Someone must have taught them. Someone must have passed along the joy we can know in such a simple game.